As we approach the mitzvah of hadlakat nerot, we are confronted with a hard truth. Being that we are in the Galut, due to external and social considerations, we are forced to light inside our homes. We assume, and rightfully so, the ideal Mitzvahof Chanukahis to be done outside. Lighting the menorah is a means of actualizing Pe’ersumaiNisa, publicizing the miracle to the masses. Naturally, lighting in one’s private domain can be seen as an act antithetical to pirsum. However, upon a further analysis of the Halacha, the reshuthayachiddoes seem to play a major role in the mitzvahof Chanukah, informing the attitude we should have when we light today, inside our homes. The Gemara Shabbos(21b) offers two understands of the requirement to light “Ad She’tichle Regel Min ha’shook.” This refers either to a specific time zone for lighting or a way to gauge how much oil should place in each cup. As for this halacha, is this timeslot unpassable or is it just a recommendation? The Rashbaunderstands this an ideal time, allowing for a greater awareness of the miracle; however, like any other mitzvahwhich is performed during the night hours, it may be done throughout the entire night. The Rambamhowever understands that this is a maximum limitation. After the time passed one may not light anymore. Following the Rashba’sruling, nowadays, the Ba’ali Tosefosexplain, given our situation, we light inside, and thus, the demand to light within the timeframe of the Gemarais null since lighting Nerot Chanukah still produces pe’rsumfor the people in his house. It seems that Tosefotunderstand the nature of publicizing the miracle today has shifted from a public forum to a more private setting. Pe’rsum’s two facets, the public and the private, are also seen in the discussion regarding the where the ideal location of lighting the menorahshould be. Rashbaargues that it must be in the Reshut Ha’rabim, not just in front of one’s home. However, Rashiand the Ba’ali Tosefotunderstand that one can light in his private courtyard, allowing the public to observe the lights. At first glance, the ability to light in his private courtyard would be seen as the chiddushof the Gemara. Obviously, one must light in the most open and public way possible, but we allowone to light inside if the public can experience the lights. There is one discussion amongst the Rishonim,however, which sheds light on the interplay between the roles of the private and public domains when lighting, pressing us to reconsider this previous formulation. The Gemara (ibid 21b) explains that one needs to light under ten tefachim. Aside from all the issues raised regarding the Pesak,one must understand where the number ten tefachimcomes from? At first glance it seems quite arbitrary. There are two approaches to answer this question. Many of the Rishonimassume that this requirement to be a function of pe’rsum. When lighting within ten tefachim, it’s more noticeable that the light is for the mitzvahand not for ulterior motives. However, there is another attitude towards the shiurof 10 tefachim. The Ritvaexplains that this size is not a function of pe’rsumof the observing ofthe lights themselves. It’s a means of definingthe domain of thener. When lighting in a public area, one’s lit candle becomes part of the public background, and onlookers don’t associate the candle with the lighter. When placed within ten tefachim, Halachadefines the candle to be in a separate reshut: the candle is now defined as yourcandle. For this reason, ironically, if one lights in inside, he doesn’tneed to light under ten tefachimbecause Halachadefined this light as yourcandle in yourhome. This explanation of the Ritvasheds light on the halachotwhich we mentioned earlier. There is value of lighting in private. On a Lechatchilalevel, lighting in a personal courtyard is not equal to that of lighting in the public domain, but may actually be even moreideal since an integral part of pe’ersumha’nesis allowing the public to recognize that the hadlakais yourhadlakah. And even if one is not able to light in the public domain due to external circumstances, one doesn’t need to be relegated to a small corner where he tries to remember what once was. Though bide’avad,lighting inside preserves a core feature of the Kiyum mitzvas Ner Chanukabi’shelmusah: the presentation of a candle which is yours, serving as the linchpin of yourpersonal connection to the miracle that occurred. This explanation helps us understand the words of the Rambamin the end of HilchosChanuka(4:12). He writes [translated] “The commandment of NerChanukais an extremely beloved mitzvah. 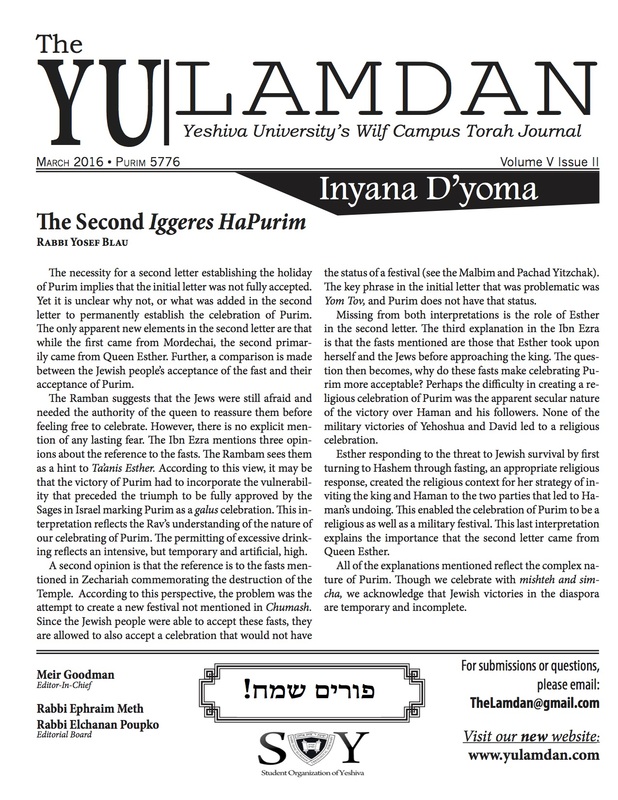 One must be very careful to fulfill it in orderto inform others of the miracle and add praises and thanks to Ha-Shem on the miracles that He performed for us.” The presentation of the Rambam is, on multiple levels, a description of mechanism of pe’ersumainesa. More than being a means to remember the miracle of the past, lighting the menorah becomes a springboard for evoking memories and recollections of how G-d, in ourtime, performed for usmiracles. Mirroring the idea of the Ritva, the goal of Chanukais to take the experiences of history and apply their outlooks and perspectives to our own lives. Consequentially, as we inject our personal, subjective encounters with G-d into those lights, the objective, historical mitzvah becomes enhanced and glorified. When lighting in the privacy of one’s home, though inhibited from publicizing the miracle, it’s critical to focus on the private aspects of pirsum, recognizing how G-d intervened in your life, allowing the miracle of the past to become that more meaningful. See Rambamwho doesn’t quote this Gemara. See BeisYosefsiman671.